LVM is a tool for logical volume management which includes allocating disks, striping, mirroring and resizing logical volumes. With LVM, a hard drive or set of hard drives is allocated to one or more physical volumes. LVM physical volumes can be placed on other block devices which might span two or more disks. The physical volumes are combined into logical volumes, with the exception of the /boot/ partition. The /boot/ partition cannot be on a logical volume group because the boot loader cannot read it. If the root (/) partition is on a logical volume, create a separate /boot/ partition which is not a part of a volume group. Since a physical volume cannot span over multiple drives, to span over more than one drive, create one or more physical volumes per drive. The volume groups can be divided into logical volumes, which are assigned mount points, such as /home and / and file system types, such as ext2 or ext3. 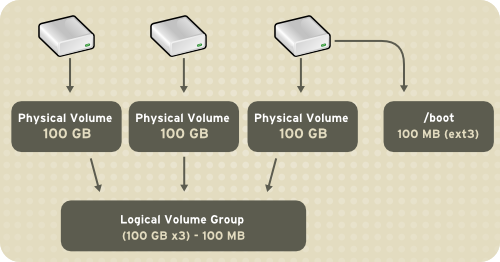 When "partitions" reach their full capacity, free space from the volume group can be added to the logical volume to increase the size of the partition. When a new hard drive is added to the system, it can be added to the volume group, and partitions that are logical volumes can be increased in size. On the other hand, if a system is partitioned with the ext3 file system, the hard drive is divided into partitions of defined sizes. If a partition becomes full, it is not easy to expand the size of the partition. Even if the partition is moved to another hard drive, the original hard drive space has to be reallocated as a different partition or not used. To learn how to configure LVM during the installation process, refer to Section 9.2, “LVM Configuration”. LVM version 2, or LVM2, is the default for Red Hat Enterprise Linux 5, which uses the device mapper driver contained in the 2.6 kernel. LVM2 can be upgraded from versions of Red Hat Enterprise Linux running the 2.4 kernel.